This quiche is a quick and easy breakfast, lunch or dinner. 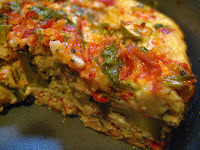 It is filled with lots of antioxidant packed veggies and great protein from the eggs. Preheat oven to 350F. Heat the olive oil in a large skillet over medium heat. Saute the onoinsfor 8-10 minutes until soft and translucent. Whole the onion is sauteing, steam the brocolli until bright green. Add the steamed brocolli, garlic, mushrooms and tomatoes to the onion and saute for 8-10 more minutes, until the brocolli softens. In a large bowl, combine the eggs, cheese, and salt. Stir in the sauteed vegetables, then pour mixture into a oiled pie plate. Bake for 30 to 35 mintues, until browned around the edges and cooked through. Let the quiche cool for 15 minutes or so and then serve. Enjoy!